My 200th movie review since 2011! What's arguably Dreamworks Animation's most acclaimed series from a critical standpoint now comes to a conclusion with How to Train Your Dragon: The Hidden World; a story following on one year from the events of its predecessor where the dragon riders of Berk, lead by Hiccup (Jay Baruchel), continue to search, fight for, and free dragons across the seas. Inevitable collateral damage from such a large scale quest eventually expands it into another; one to seek out the mythical Hidden World, a place of harmony and secrecy, where dragons can forever be safe from the persistent hatred of mankind. The Hidden World is beautifully animated; that's the standard praise that one always starts with. Such technical prowess is to be expected from modern day Dreamworks, and with a refined art style to support this technical splendour, the final on screen visuals deliver without fault. Accompanying this is of course another rich score from the acclaimed John Powell; one that fluently combines rich new compositions alongside superb throwbacks to recognisable themes established throughout the series. There's really no flaws with The Hidden World on an aesthetic level; when it comes to storytelling, things are also fairly solid. Considering this is the conclusion to the trilogy, the film certainly succeeds in delivering a satisfying ending to the overall narrative; not a generic happy ending, nor one that's overly depressing in an attempt to be original and excessively complex. In fact, it's a unique blend of both, strange as that may sound, and further bolstered by the fact that it's far from predictable. It's a conclusion that's heartfelt and well executed, and one that clearly had some decent thought put into it. But what's a shame is the emotional integrity of the ending isn't consistent throughout the overall narrative. Moments when the film really demands a more serious tone are occasionally shunted aside in favour of somewhat juvenile humour and repetitive jokes, which renders some potentially powerful moments incredibly unsatisfying and certain supporting characters rather irritating. This is a funny script, but it's a shame it favoured this occasionally silly approach during moments where it could've been a lot deeper and potentially darker; this is especially apparent during some of its set pieces and climactic scenarios. The set pieces on offer are still exciting and fun, and of course still need their fair share of humour, but there are times when such humour is once again a tad overbaked. 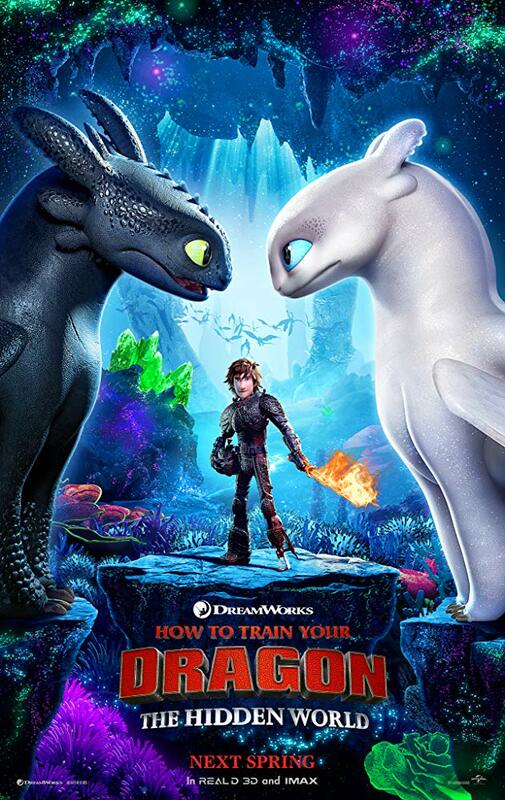 Arguably The Hidden World's most impressive traits, aside from its aforementioned aesthetic achievements and well executed ending, lie within these relatively exciting (if occasionally somewhat forgettable) action sequences, the impressive lead vocal performances, primarily Baruchel reprising his role as Hiccup, as well as an element to its narrative featuring the lead dragon Toothless developing a charming relationship with another dragon of his kind; one we find is crucial to later parts of the story. Our key antagonist, dragon hunter Grimmel, is a fairly bland villain with little backstory and cliché motives, but he has a few exciting moments and is brought to life by a solid performance by F. Murray Abraham. For the most part, The Hidden World is a fun animated finale to a great series, just one that's weakened by some bland (and occasionally annoying) supporting characters and jarring tonal shifts.